Prasad (which literally translates as “mercy” or “grace”) refers to any material substance that has been touched or blessed by a spiritual Master. As an emanation of God’s grace, the Master confers his/her Divine consciousness into the object (often food), which then forever sustains this blessing — thereby sourcing, purifying, and transforming the body, mind, and spirit of the one who receives it. Louix Dor Dempriey is a spiritual Master who has come into this world to help people restore their inherent divinity and live as unconditional love. Louix’s darshan (receiving his personal blessing), as well as his illuminating discourses, meditations, and ceremonies, have invoked profound transformation in thousands of people of all spiritual and religious paths, and from all social, economic, and cultural backgrounds. With grace and humor, he imparts timeless wisdom in contemporary, practical teachings, making self-mastery and true, inner peace attainable for all — for his life models both the journey and the victory of God-realization. The Louix Dor Dempriey Foundation has been established in his name to serve humanity by providing a model for conscious living based on the universal principles he both lives and teaches. 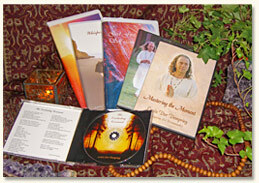 Louix lives at Prema Drala Ashram in Southern California. He also has ashrams and study groups around the world. © 2019 Prasad, the official store of the Louix Dor Dempriey Foundation. All Rights Reserved.